The Dane Johann Julius Exner is born in Copenhagen in 1825 and, later on, he decides to become an historical painter but, obliged by economic reasons, devotes himself to genre painting, it is, to portrait everyday life scenes in a realistic way. From a stipend granted by the Danish Academy of Art, Exner travels for two years to Germany, Austria, Switzerland, France and Italy, where he paints his most famous work, En gondol. Is interesting the fact that, although the artist devoted exclusively to Danish scenes, he becomes famous for a painting created in another country. En gondol shows the interior of a Venetian gondola. 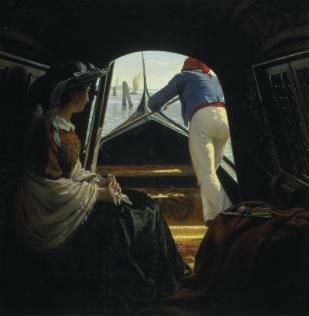 A woman on the left stares at the gondolier who, bathed in light, leans to paddle and to take the ship to its destination. What I like the most in the work is the angle the artist uses. The dark interior of the gondola in combination with the illuminated exterior make us feel like in a tunnel, a passage to another dimension. The contemplative upper class woman contrasts with the gondolier that tries very hard to direct the little ship. ~ by Álvaro Mazzino on October 18, 2010. If you have a “thing” for classic sneakers in OG colorways then you’re probably hyped for this weekend as we’ll see the return of the Air Jordan 1 Retro High OG Metallic Red. This entry was posted on October 18, 2010 at 14:29 and is filed under Realism.You can follow any responses to this entry through the RSS 2.0 feed.You can leave a response, or trackback from your own site. Previous: I came back from Peru and Bolivia!